The Cube Cyclocross: The Cube Cyclocross Announces A Bike Rally For Kids. 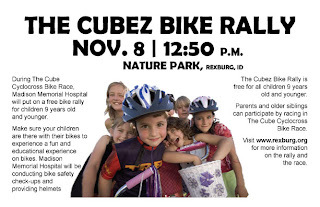 The Cube Cyclocross Announces A Bike Rally For Kids. Parents, come cheer for your children as we have a bike rally for children 9 and under. The rally will begin at 12:50 pm before the prize giveaway on the last race, Nov. 8. واعادة تجميع السفرة والنوم وتعليق المطبخ وهذا من اجل الحفاظ علي محتويات الغرفة بالكامل وخوفا عليها من الضياع .